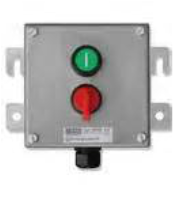 The SXCS range of control stations have been designed for use in potentially explosive atmospheres and are suitable for all gas groups including hydrogen. Based on the SX range of enclosures, they are manufactured from high quality 316 stainless steel. This material offers the highest degree of environmental protection and is suitable for even the most arduous of conditions. Additionally, stainless steel prevents the build up of static electricity, making these controls stations ideal for use in dust hazard applications. Certified to ATEX, IECEx and InMetro standards, the SXCS is available with a selection of different manufacturers operators.